Colombia on Sunday mourned the deaths of an estimated 200 people in the mudslide-devastated town of Mocoa as rescuers searched for survivors in a sea of muck and debris. A “profoundly saddened” Pope Francis weighed in with a message of grief and solidarity with the suffering people of Mocoa, a town of 40,000 in Colombia’s Amazon basin. “I pray for the victims and want to assure those who weep for the missing of my closeness to them,” the Pope said in a statement. It swept away homes, bridges, vehicles and trees, leaving piles of wrecked timber buried in thick mud. The Colombian Red Cross put the number of confirmed deaths at 200, adding that it was unclear how many people were still missing. Earlier reports said more than 100 were unaccounted for. At least 203 people were injured, some 300 families were affected and 25 homes destroyed, the Red Cross said. As the rain lifted, residents picked their way through a landscape of destruction looking for loved ones or trying to salvage meagre belongings. Most of the hardest hit neighbourhoods are poor and populated with people uprooted during the country’s five-decades-long civil war. Marta Ceballos, a 44-year-old street vendor, said she lost everything to the mudslide, but says she is thankful her family is alive. “Dear God, I don’t want to even remember that,” she said. “To see how some people screamed, and others cried, ran, tried to flee in cars, on motorcycles, and how they were trapped in the mud. It’s all too, too difficult,” she said. “The only things I fortunately did not lose were my husband, my daughters and my nephews,” she said. Light rain and showers were in the forecast for Sunday but precipitation was expected to diminish on Monday and Tuesday, Colombia’s national weather institute said. President Juan Manuel Santos was scheduled to return on Sunday to Mocoa, the capital of the department of Putumayo, along with Cabinet Ministers to supervise rescue efforts in the heavily forested region. The President met with rescuers and survivors in Mocoa on Saturday, and declared a public health and safety emergency to speed up rescue and aid operations. 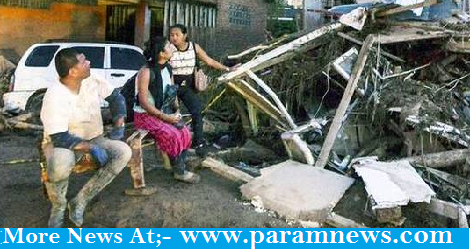 Putumayo Governor Sorrel Aroca called the event “an unprecedented tragedy” for the area. There are “hundreds of families we have not yet found and whole neighbourhoods have disappeared”, he told W Radio on Saturday. Carlos Ivan Marquez, director of the National Disaster Risk Management Unit, told AFP the mudslides were caused by the rise of the Mocoa River and its tributaries. Some 130 mm of rain fell on Friday night. “That means 30% of monthly rainfall fell [in one night], which precipitated a sudden rise of several rivers,” he said. “Our prayers are with the victims and those affected,” he added. One thousand emergency personnel, including soldiers and local police, were deployed to help the rescue effort. Mocoa was left without power or running water, and there were reports of people looting stores searching for bottled water. “There are lots of people in the streets, lots of people displaced and many houses have collapsed,” retired Mocoa resident Hernando Rodriguez (69) said by telephone. “People do not know what to do... there were no preparations” for such a disaster, he said. Several deadly landslides have struck Colombia in recent months. A landslide in November killed nine people in the rural southwestern town of El Tambo, officials said at the time. In the previous month, 10 people lost their lives in a mudslide in the north of the country. The Pacific rim of South America has been hard hit in recent months by floods and mudslides, with scores killed in Peru and Ecuador as well. Climate change can play a big role in the scale of natural disasters, such as this one, a senior United Nations official said. “Climate change is generating dynamics and we see the tremendous results in terms of intensity, frequency and magnitude of these natural effects, as we have just seen in Mocoa,” said Martin Santiago, UN chief for Colombia. Colombia landslide sallowed 200 People Emergency declared Heavy rainfall on Friday night precipitates a sudden rise in rivers, devastating Mocoa town Colombia on Sunday mourned the deaths of an estimated 200 people in the mudslide-devastated town of Mocoa as rescuers searched for survivors in a sea of muck and debris.